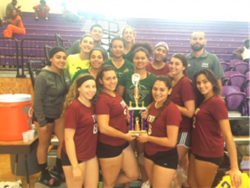 FNU Volleyball Team Takes the Victory in Jacksonville Tournament. As a team, we feel more confident. Over the weekend, the team created a unique bond and we are a step closer to Nationals. ~Bianca Baez, Team Captain. Florida National University (FNU) Lady Conquistador Volleyball team brought home a victory winning the Edward Waters College Fall Classic tournament in Jacksonville, Florida this past weekend. The weekend of August 26th and 27th brought great success and pride to FNU, more specifically, the Lady Conquistadors Volleyball Team. The team, led by Head Coach Carlos Huaroto-Luque, traveled north to Jacksonville, FL to compete in the annual Edward Waters College Fall Classic. After coming up short in their previous match versus Missouri Baptist University (ranked #2 in the National Association of Intercollegiate Athletics), the ladies were determined to leave the tournament victorious and that they did. The tournament featured our Lady Conquistadors participating in a 4 game slate, with doubleheaders on both days. With matches against Johnson and Wales University, Ave Maria University, Concordia College and Tougaloo College, the team certainly had their hands full, yet still rose to the occasion and won the tournament in dominating fashion, only losing 1 set in total and sweeping the 4 games! After an offseason of hard-work and high expectations, the Lady Conquistadors are off to a fast start, boasting a 6-1 record and are primed to have the best year in the program’s history.